Summary: This hike takes you to the nicest canyon in the Superstitions. Directions: From Phoenix take US 60 east. Exit at Apache Junction and drive northeast on State Highway 88. Follow 88 until you cross the second one lane bridge, just past the bridge on the right hand side you'll see a sign for the Boulder Canyon Trail. Parking is available at the Canyon Lake Marina on the left hand side. Road Conditions: Passenger Car - paved all the way. Hike Description: From the parking area at the marina, cross the road and begin hiking on the rocky Boulder Canyon Trail. The trail ascends moderately with views down into the outlet of La Barge Creek to the right. Eventually the trail bends left then climbs somewhat more steeply until topping out at an unnamed hill with nice views to the southeast of Geronimo Head and Battleship Mountain with Weavers Needle poking over the hills in the distance. The trail descends somewhat, swings to the left, then right and winds it's way along the hill side before dropping steadily down into the drainage of La Barge Creek. The Boulder Canyon Trail continues across the drainage, but we turn left here and begin boulder hopping our way up La Barge Creek towards the pyramid shaped rock in the distance. After some scrambling, climbing and bush wacking you will come to the entrance of La Barge Canyon. Sheer rock walls frame La Barge Creek through this beautiful area. The best part of the canyon isn't very long, and the turn around point is arbitrary. When ready, return down the stream bed to the intersection with the Boulder Canyon Trail. From this point you have two choices, either: backtrack the way you came, or continue down La Barge Creek. This latter, somewhat more adventurous route travels through nice canyons, however some annoying bush wacking is required. 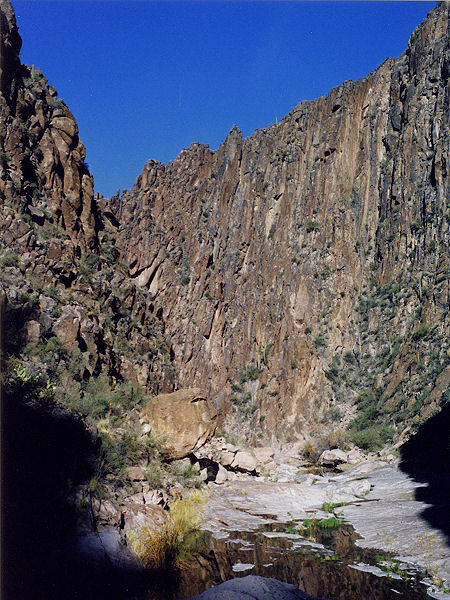 Towards the end of La Barge Creek, before reaching the point where Canyon Lake floods the canyon, look to the right for a moderately faint use trail that leads up the hill side connecting a short time later with the Boulder Canyon Trail. Follow the trail the remainder of the way down hill to your car. The hiking part of this trip is so-so (rocky and weedy in places), but La Barge Canyon, though short, is so pretty that I give this hike high marks. 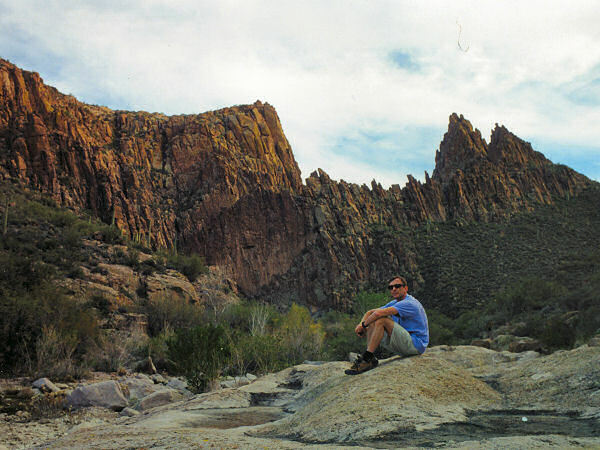 The author completed this hike including the lower portion of La Barge Creek in about 5 hours. Photos: Click picture for larger view, click your browser's 'Back' button to return to this page. is located near the peaks. La Barge Box.